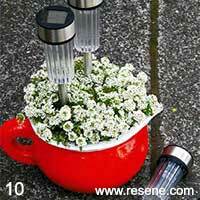 Mark Rayner shows you how to create this fabulous fragrant outdoor solar light for alfresco drinks or dining – perfect for a Christmas Eve get-together. You will need: Terracotta pot or bowl with a drainage hole (our jug-shaped pot came from mitre 10 mega), three outdoor solar lights, paintbrush, paint stirrer, good-quality potting mix, white Alyssum, Resene Resene Concrete Clear, Resene Sandtex Mediterranean effect, Resene Terracotta Sealer and Resene testpots of Resene Alabaster and Resene Bullseye. Here's another idea: Create a rich golden metallic look by painting the pot with one coat of Resene Porsche and two coats of Resene Bullion. 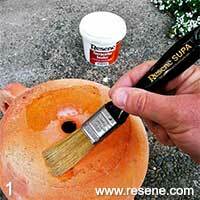 Apply one coat of Resene Terracotta sealer to the pot and allow to dry. 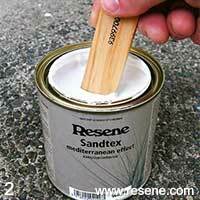 Carefully stir the Resene Sandtex with a paint stirrer to ensure the particles are evenly dispersed. 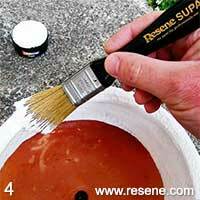 Apply one coat of Resene Sandtex to the rim and outer sides of the pot, lightly dabbing to create a textured effect. Allow to dry. 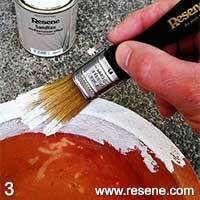 Paint the inner and outer rim with two coats of Resene Alabaster, allowing two hours for each coat to dry. 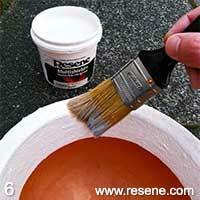 Paint the sides of the pot with two coats of Resene Bullseye, allowing two hours for each coat to dry. 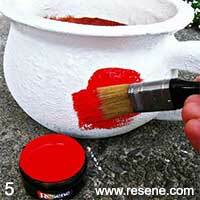 Apply three coats of Resene Multishield+ gloss to the rim and outer sides of the pot to create a high-gloss finish. Allow two hours for each coat to dry. 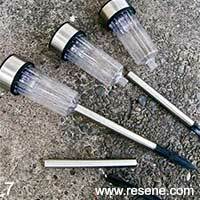 Assemble the solar lights, following manufacturer's instructions. 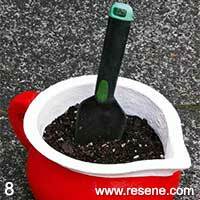 Fill the pot with good-quality potting mix. 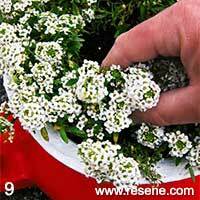 Plant the pot with white alyssum and water thoroughly. 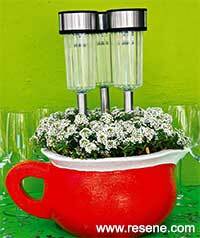 Allow water to drain. Insert the three solar lights into the potting mix.